Partners: McDonald Bradley Inc., Herndon, Va.; Autonomy Inc., San Francisco; BEA Systems Inc., San Jose, Calif. ;Northrop Grumman Corp., Los Angeles; Oracle Corp., Redwood Shores, Calif. , and Sun Microsystems Inc., Santa Clara, Calif.
Goal: As it moves toward network-centric operations for sharing information, the Defense Department needed to test new application capabilities and use them on a limited basis. Obstacle: Much of the data the department wanted to share rests in legacy systems. Making it available to several defense agencies and coalition partners required a highly secure solution that protected the legacy investments and controlled access to sensitive information. Solution: As part of the Defense Department's Horizontal Fusion initiative, McDonald Bradley developed a shared workspace on the top-secret SIPRnet and a companion portal for accessing data and Horizontal Fusion applications. With Northrop Grumman, the company also developed a security toolkit that programs must integrate to ensure that users only use data they are cleared to see. Payoff: The McDonald Bradley solution lets DOD test and use new network-centric applications on live data. Each year, the Horizontal Fusion team demonstrates its programs and rolls out the applications that meet its requirements. The applications can be exploited in the McDonald Bradley-designed workspace without supplanting DOD's legacy systems ? yet. 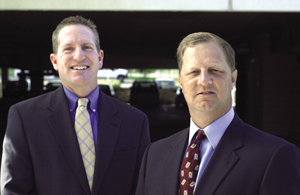 John Sutton, vice president for intelligence, surveillance and reconnaissance, and Ken Bartee, CEO of McDonald Bradley. If the Defense Department remains intent on spiraling network-centric capabilities to the warfighter, then it has a major challenge on its hands, according to some experts. Skeptics of spiral development, a process that speeds design and deployment of new weapons and systems, worry that launching largely untested systems to help transform the military could backfire. "Being blinded by the beauty of information technology theory is probably the worst threat that IT faces," said Tony Cordesmann at the Center for Strategic and International Studies in Washington. The concern is particularly acute when it comes to applications for sharing sensitive data across agencies and among coalition partners. That's why the Defense Department has begun testing and using network-centric applications in a limited corner of its top-secret SIPRnet as part of its Horizontal Fusion initiative. Defense hired McDonald Bradley Inc., Herndon, Va., to develop the primary tools for validating Horizontal Fusion programs and making them available online. Horizontal Fusion is a portfolio of tools that exploit shared data to help military users make better decisions. It's designed to use the Defense Information Systems Agency's evolving Network Centric Enterprise Services, so that information is easily accessible through a secure Web browser. "Migrating onto this infrastructure means doing things like standardizing data formats and applying meta data tags, so that the information can be exchanged in a format that everybody can ingest," said Marian Cherry, Horizontal Fusion's portfolio manager. Working under a pair of contracts from the Defense Intelligence Agency worth $28 million, McDonald Bradley has developed what is called the Collateral Space, a virtual workspace and data store on the SIPRnet where Defense Department domains publish encrypted information. The company also built an access tool called the Mars portal that military planners, warfighters, logisticians and others can use to find relevant data. According to Ken Bartee, McDonald Bradley's chief executive officer, the company's expertise in semantic Web technology, which changes Web-page information into discrete data, gives it a leg up in meeting the requirements of Horizontal Fusion. "The tagging and search tools help you get back what you want and not what you don't," Bartee said. "Analysts will still do their job, but sometimes a warfighter needs raw data faster." Using their own production solutions or tools that McDonald Bradley customizes for the Defense Department, users publish information to the Collateral Space. It then resides in a separate Oracle database running on Sun hardware where other users can access it. Horizontal Fusion applications, including search, collaboration and language translation tools, are launched from within the Mars portal, which was built using BEA WebLogic software. McDonald Bradley developed its own search capabilities for the portal using technology from San Francisco-based Autonomy Inc., which specializes in handling unstructured data. "If you want information about tanks, you need to get back information about armored vehicles, not toilet tanks," Bartee said. According to John Sutton, vice president of McDonald Bradley's intelligence sector, a key of the company's solution is its security toolkit, which goes out to all department users authorized to publish data to the Collateral Space. Users log into the network using public key infrastructure certificates. Cherry said use of PKI on the SIPRnet is not as prevalent as it is on the unclassified NIPRnet, but as it becomes more widespread, Horizontal Fusion will require a way of matching data to authorized users. "We're working on a cross-domain information exchange solution to put people with different classification levels on the same network, and then adjudicate between their strong identification and authentication, and the data that's available to make sure they only see what they're cleared to see," Cherry said. With Northrop Grumman Corp.'s Mission Systems unit, McDonald Bradley created a developer toolkit that Horizontal Fusion applications must incorporate to meet Defense Department security standards for information systems. The toolkit helps secure data and control access to it. The Horizontal Fusion team demonstrates its capabilities in Quantum Leap, a war game that involves various sites that use the Collateral Space and Mars portal to react to a hypothetical scenario. After this year's event, about 80 percent of the Horizontal Fusion functionality will go live in the SIPRnet's Collateral Space, where users can access it for day-to-day operations, Cherry said. As the department transitions to the Global Information Grid and Network-Centric Enterprise Services, Horizontal Fusion programs will be used departmentwide, not only in the Collateral Space.